EDSON, AB – Major renovations to the Northern Provincial Pipelines Ltd. official racing website began last week. “We are on schedule for a late February early March re-launch,” says NPP Series announcer Gord Craig, “right now we are fairly close to finalizing the design and layout of the home page.” Since its launch, back on May 1st, 2007, there have been only a few subtle cosmetic changes to the npp-racing.com website. “Over the years we’ve expanded our web content (news stories, video and stats) but overall the basic layout of our website hasn’t really changed that much.” Although the layout has remained virtually the same, technology has not. 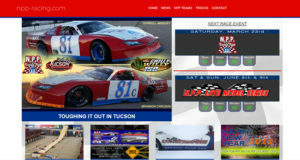 “Right now we are using a website program that’s over 15 years old,” admits Craig, “when we first launched our website, smart phones were just being introduced.” Craig says with more hand-held devices and tablets in use today, the npp-racing.com website needed to change. “The past few years we’ve really seen the limitations of our website program when it comes to current hand held technology. This re-design is more than just a simple coat of paint.” Once the basic design of the new web page is approved, the transfer of content begins.